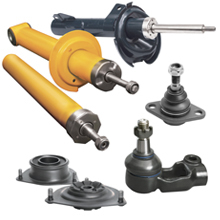 Ball joints are connecting links of suspension parts and are used where it is necessary to achieve joint with high-mobility links. Force intensity rate passed to ball joints, depends on vehicle weight, suspension kinematic scheme and other factors. Special inserts made of high-strength plastic with low friction coefficient are used in construction of HOLA ball joints. Ball pins are manufactured from alloy structural steel and are heat-treated according to hardening method up to 32HRC, that secures ball pins high durability. Tie rod ends provide connection between driven wheels and steering. Like all steering parts, tie rod ends are important elements that affect on road safety. HOLA tie rod ends with spherical joints and sealed assembly polymer bearings are constructed according to principle of spherical joint. The most advanced materials and technologies are used for production of HOLA ™ tie rod ends. High quality is ensured by production automation and effective organization of quality control. Ball pins are made of alloy structural steel. McPherson type of front suspension strut mounts is designed to forces transfer from struts to vehicle body, vibration decrease as well as adjustment of angular movement from suspension.